Understanding dormancy requirements for woodland, medicinal plant species is a requirement for discovering how they initiate their relationship with soil fungi. Sanders & McGraw (2002) noted that despite wide geographic distribution, seedling establishment is a constraint in wild goldenseal (Hydrastis canadensis, L.) populations. Richo Cech, of Horizon Herbs, has been quite successful teasing recalcitrant, deep-forest medicinal species to break dormancy using forest propagation studies (2002). Baskin and Baskin (2014) noting that goldenseal was a two-phase germinator, with some seed germinating only as root tissue and lacking aerial development until the second year. They indicated that this appeared to be a developmental pattern found in several native plant species growing in the same habitat as goldenseal. From the stand point of understanding the chemical ecology of medicinal plants, this may allow the roots to interact with the rhizosphere community of fungi longer and, in the case of goldenseal, to develop the anti-microbial alkaloid pool necessary for defense of aerial growth the following season. In a closely related plant family, Berberidaceae, alkaloid production in Berberis vulgaris occurs immediately after seed germination and increases with seedling age (Pitea et al. 1972). This suggests that the medicinally active alkaloids in root tissue are important to the defense of the plant seedling from the onset. Data is lacking on goldenseal rootlet interactions with rhizosphere fungi post-germination. Initial screenings of mature, wild goldenseal root populations (Tims, 2008) indicated that arbuscular mycorrhizal fungal (AMF) were not associated with either root or seed tissue, and that AMF spores were not found in the rhizosphere soil of the plant. Goldenseal roots did appear to form an endophytic relationship with a zearalenone (ZON) producing Fusarium oxysporum, normally associated with pathogenic characteristics (Tims and Bautista, 2007). Zearalenone (ZON) has reputed auxin-like (plant hormone) effects on plant tissue, promoting development of lateral roots (Celenza et al. 1995), and stimulating root tip growth (Bean et al. unpublished). These are regions of the root where soil fungi would attempt to enter the plant tissue. In contrast, this particular endophyte appeared to co-exist within the plant root without causing obvious signs of ill health. It is possible that the production of ZON by Fusarium may affect meristematic activity in H. canadensis emerging from dormancy by initially stimulating rootlet formation and root exudation. Rootlet interaction with ZON during the early phase may benefit the plantlet by increasing plant secondary metabolite formation. Tims and Bautista found that an alkaloid in mature goldenseal root tissue, hydrastine, inhibited ZON production in the endophyte. 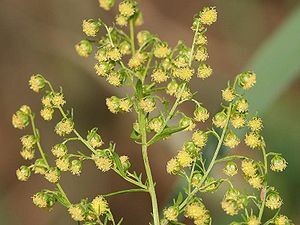 Cech (private communication) collected cultivated goldenseal from Kentucky and Oregon, and found that berberine levels were higher in the leaf and hydrastine levels higher in the root. This too would corroborate the results by Shitan et al. (2005) that an ABC pump moved berberine from root tissue to aerial portions of the plant. The interplay between ZON produced by the fungus and hydrastine found in goldenseal root would appear to have a two-fold effect. Hydrastine may limit more aggressive pathogenesis of the root tissue by F. oxysporum, while ZON may stimulate the production of hydrastine in developing goldenseal root. An additional developmental question that needs to be explored is to what degree might the presence of ZON, or similar microbial compounds in the rhizosphere, favor or induce two-phase germination? Baskin, CC and Baskin, JM. (2014) Seeds: Ecology, Biogeography, and, Evolution of Dormancy and Germination, 2nd Edition. Academic Press: Cambridge, MA. Cech, R. (2002) Growing At-Risk Medicinal Herbs: Cultivation, Conservation, and Ecology. Horizon Herbs Publication, Williams, Oregon, pp.41-51. Celenza JL, Grisafi PL, Fink GR (1995) A pathway for lateral root formation in Arabidopsis thaliana. Gene Dev 9: 2131–2142. Pitea, M, and Margineanu, C. (1972) Correlations between Chemical Structure and Antibacterial Activity of Berberine. Clujul Med 45:465. Sanders, SM, and McGraw, JB. (2002) Distribution, Abundance, and Population Dynamics of Goldenseal (Hydrastis canadensis L.) in an Indiana Nature Preserve, USA. Nat Areas J 22:129. Shitan, N, Kiuchi, F, Sato, F, Yazaki, K, and Yoshimatsu, K. (2005) Establishment of Rhizobium- Mediated Transformation of Coptis japonica and Molecular Analyses of Transgenic Plants. Plant Biotech 22:113. Tims, M.C. (2008) The Chemical Ecology of Goldenseal (Hydrastis canadensis L., Ranunculaceae): How medicinal plants roots control the microbial communities in their rhizosphere. VDM Verlag, Saarbracken Germany. Tims M.C. and Bautista C., (2007) Effects of Root Isoquinoline Alkaloids from Hydrastis canadensis on Fusarium oxysporum isolated from Hydrastis Root Tissue, Journal of Chemical Ecology, 33:1449–1455.